Long before either was knighted for sea-going exploits in England’s service, George Somers and his friend Amyas Preston were professional privateers. They were among hundreds of Englishmen of that day who became involved in the privateering business because of its promise of adventure, glory and quick, substantial profit. Preston lived in Cricket in Somerset, inland a little from Lyme Regis in Dorset, where Somers was born. He owned at least one ship, the Julian, whose home port was Lyme. Although history remembers nothing of Preston’s family and place of birth, he and George Somers must have had similar backgrounds. They were about the same age. They had both become skilled and well-known seamen while they were still young men, so it was natural that they should know each other. Preston made a name for himself during the battle against the Spanish Armada in 1588. Somers first sailed into the public eye when, heading toward Spain in command of the Flibcote, and in the company of three other vessels, he brought home Spanish prizes worth more than £8,000—the equivalent of millions today. They both became embroiled in lawsuits, common during the days of privateering, over the distribution of spoils. Some believe that Preston had challenged Sir Walter Raleigh to a duel over prizes taken during an expedition to Newfoundland in 1585, although there is no record of it having been fought. Nonetheless, Preston and Somers agreed to take part in Raleigh’s proposed expedition to Guiana in 1595. What influence was brought to bear on Preston and Somers to get them to take part is not clear, but it is a little beside the point, since they did not really take part in the Guiana voyage at all. Instead, they seemed to be on a quite separate expedition from start to finish, meeting up with the Guiana fleet only once at the end of its journey, and then by accident. Preston’s fleet consisted of the Julian and its little pinnace, the Delight, together with the Ascension, the Gift, the Derling and the Angel. Like Raleigh’s ships, they carried a larger number of soldiers than was usual. This gave them an advantage in land operations, of which the pugnacious Preston took full advantage. While Raleigh’s expedition was primarily one of exploration, the Preston/Somers journey to the West Indies seemed to have been a prize-taking venture from the start. In the end, their cruise was not wildly successful in the moneymaking department, but it did give history a dramatic and cunningly conceived attack on Caracas. That battle, if a battle it can be called, is well known to students of such things, and the nineteenth-century writer Charles Kingsley used it as the basis of his most popular adventure, Westward Ho. The battle may also have exposed a man who might well have been the inspiration for Miguel de Cervantes’s The Ingenious Gentleman Don Quixote of La Mancha, a book that was first published only 10 years after the Caracas affair. Preston and Somers put to sea late, long after Raleigh’s fleet left England. Toward the end of March, Preston left Somers and the others to chase a sail his crew had spotted on the horizon. The ship got away, but having separated himself from the rest of his ships, Preston decided to start a little scrap, presumably to test the capabilities of his men. He set sail for Porto Santo, a small island north and east of Madeira. It was the agriculturally rich home of many retired Portuguese soldiers. Preston attacked, trying to land on the island with two longboats full of soldiers, but the inhabitants threw up some strong defences. Preston and his men retreated to his ship, but before dawn the next day, he landed a force of 60 behind the defenders and attacked from the rear. The Portuguese fell back on their town, from which they had evacuated their wives, children and valuables to the top of a high, easily defended hill. Preston’s men chased them out of the town, but they dared not risk an assault on the hill. They burned the town instead. Preston caught up with Somers and the others in April at the Canary Islands. By that time, three other privateers, all from Southampton, had joined up with them. They set off across the Atlantic, bound for the West Indies, arriving off Dominica in May. After a rest, they sailed southwest toward South America, arriving at a little group of three islands just off the coast of Venezuela, called Isla Margarita, Coche and Cubagua. Venezuelan Indians dove for pearls there. 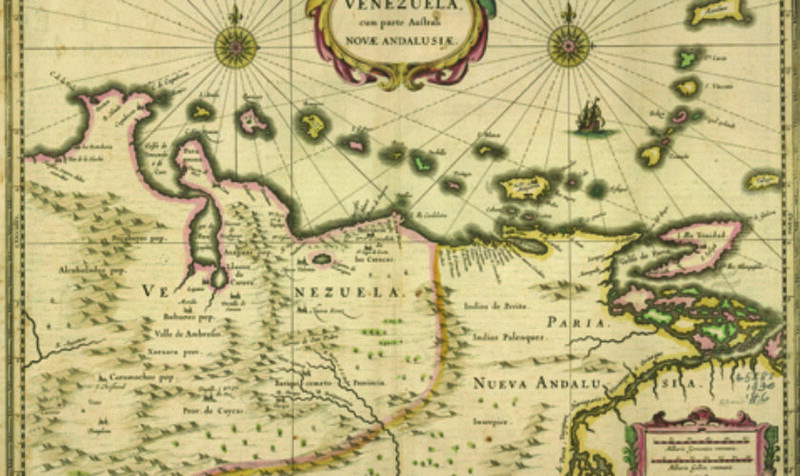 The raiders managed to capture a few Spaniards and their slaves at Coche, then headed across to Cumana, a town on the Venezuelan coast south of Coche, and about 200 miles east of Caracas, then one of Venezuela’s main settlements. The geography of Caracas, founded as Santiago de Leon de Caraccas and known to the English in the sixteenth century as San Jago de Leon, is important in this story. It was built on a high plain, at an altitude of between 2,500 and 3,000 feet. It is very close to the Caribbean, but there is a mountain range of up to 7,000 feet, called the Cerro Avila, between it and its sea-level port, Guayra. There was a well-travelled path between the two in Preston’s and Somers’s day, but it was cut through such narrow, difficult terrain that a small force could defend it easily. On the coast near the bottom of that path was a fort, used as another defensive feature to discourage unwelcome visitors. There, Preston and Somers found no defenders. They did find the fort’s commander, however, asleep in the woods nearby. He was an elderly man, too sick to travel and hence abandoned by his troops. He told them the Spanish had received word of Preston’s coming a month before and had abandoned the fort as unnecessary. The defenders of Caracas had posted troops at strong barricades on the path to the city to prevent them from getting over the Cerro Avila. Preston asked if there was another way up, and the Spaniard admitted there was—a path the Indians used—but it was so difficult that the defenders had thought there was little danger of anyone else using it. Just in case, though, they had blocked it by choking it with felled trees. It was a path to which Preston and his men would need to be guided. There are two different versions of the subsequent assault on Caracas: an English version and a Spanish version. The English version derives mainly from Robert Davie’s contemporaneous account, widely accepted by historians as the one most likely to be true. The Spanish version appears to have begun with an official report sent by an officer of the Spanish forces to the Spanish government, and it has been embellished by historians over time. The differences are fascinating and surely have their roots in Spanish embarrassment at having the supposedly invincible Caracas snatched from under their noses. t him go once he got them to the top. His offer was accepted, and Davie says the English made good on their agreement. Davie wrote: “The next day, early in the morning, we set forward to recover the tops of the mountains, but, God knoweth, they were so extreme high and so steep upright, that many of our soldiers fainted by the way; and when the officers came unto them, and first entreated them to go on, they answered they could go no farther: then they thought to make them go by compulsion, but all was in vain; they would go a little then lie down, and bid them kill them if they would, for they could not, nor would not, go any farther; whereby they were enforced to depart, and to leave them there lying on the ground. The English formed three groups, the main battle group in the center, commanded jointly by Preston and Somers, and a smaller, flanking force on either side. The English thought the Spanish would attack, but they remained in place. Two of the English junior commanders ran forward toward the Spanish, firing, and the Spanish fled, leaving behind one dead soldier. None of the attackers was hurt. Preston and Somers entered the now-deserted town and settled in. There was little plunder, as the inhabitants had spirited everything they could carry away with them into the country. A day or two later, a Spanish officer appeared to negotiate a price for the return of Caracas to the Spanish. Davie describes the negotiations as delicate. Preston and Somers demanded 30,000 ducats. The Spanish offered 2,000 ducats, then 3,000, then 4,000. Insulted by these small offers, Preston and Somers lost patience and told the officer that if the Spanish did not come up with 30,000 ducats by noon on the following day, they would burn the town. Overnight, however, the English received intelligence from Indians that the Spanish had sent for help and were delaying the negotiations until reinforcements could arrive. Preston and Somers were furious. This was an offence against the rules of polite parley. In the morning, they burned Caracas and some surrounding settlements to the ground, as they had threatened. Taking whatever they could, they marched back to their ships and set sail for England. Preston and Somers arrived in September 1595, after six months at sea. You may think the Spanish version of the taking of Caracas discredits the substance of the story. After all, they had to excuse some fairly ugly facts: A couple of hundred English privateers outflanked defences the Spanish had apparently had a month to construct; they routed the Spanish troops and burned the place to the ground because the Spanish authorities bungled the ransom negotiations. Spanish historians put the blame for the English being able to find and negotiate the Indian path on a Spanish man called Villalpando, who they say the English found on the coast. They also say that once he had guided Preston and Somers to a point from which Caracas could be seen, Preston had Villalpando hung and his body flung from a precipice, on the grounds that a traitor deserves death no matter whose side he is on. Villalpando’s death, the Spanish seemed to believe, avenged the man’s responsibility for their defeat. Spanish historians say Preston and Somers commanded 500 soldiers when they attacked Caracas. It would have been almost impossible for their fleet to carry that many. The generally accepted number is about 200. The Guayra fort’s commander said the Spanish had a month’s notice of Preston’s and Somers’s arrival. Despite that, or perhaps because of it, the Spanish military commander was away from Caracas when Preston and Somers arrived. Yet at least one Spanish account gives him credit for having defeated the English in battle at Caracas. Another Spanish historian insists it was not Preston and Somers who sacked Caracas, but El Draque—the much-feared Sir Francis Drake. There was no defeat of Spanish soldiers near the city, they say, because they were all guarding the path over the mountains to Guayra. The inhabitants of Caracas had fled with their valuables into the countryside. When the English came into sight, only a certain Alonso Andrea de Ledesma went to meet them, on horseback, in full armour. One man. Alone. The Spanish historian Don Joseph de Oviedo y Baños, writing in a history he published in Madrid in 1723, explains: “Alonso Andrea de Ledesma, though of an advanced age, deeming it against his reputation to turn his back on the enemy without giving proof of his valour, moved rather by temerity than courage, mounted his horse and with his spear and shield went out to meet the corsair, who, marching with all his flags flying, (was) advancing toward the city. Well. An elderly, noble knight is admired and honoured by the English for his single-handed, brave and thoroughly quixotic defence of Caracas. It is such a terrific story that one wants to ignore the great likelihood that it was just a tale designed to detract from the fact that the troops on horseback ran away from Preston and Somers, almost without firing a shot. ling that “only fools would laugh at it.” Fools, he might have said, with hearts dead in their chests.